I am a huge fan of roasting as a cooking method, but for some reason, I’ve had a mental block about roasting a whole fish. Why? I have no idea. Maybe it’s the head? Yes, most likely, it’s the head. And the bones. I mean, I know how to carve a chicken, but a fish? Uncharted waters, my friends. Recently, though, I read a post from Locals Seafood about roasting fish that compared it to roasting a chicken in terms of ease and deliciousness. And during our trip to France, where fish is commonly served roasted and whole, we learned firsthand how delicious and moist it can be. So why not give it a try? 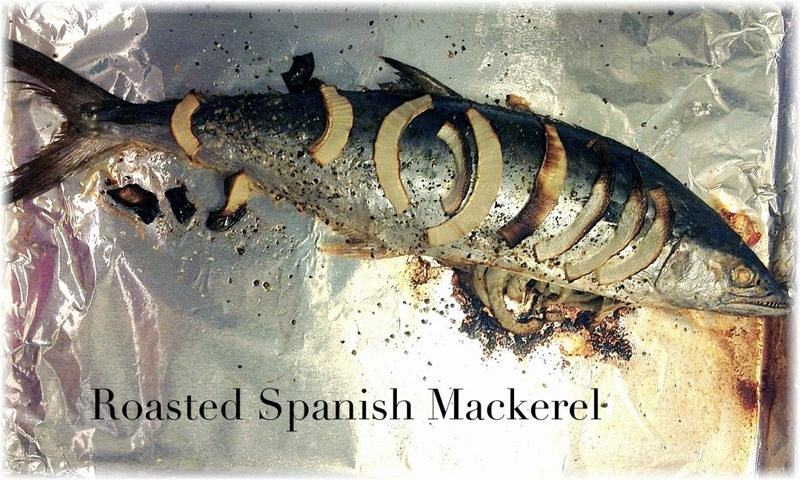 This recipe is for roasted whole Spanish mackerel, a sustainable fish commonly caught in North Carolina waters. You can substitute any medium sized fish for this recipe though. It is very simple and incredibly delicious. Stuffing the fish with fresh fennel, onion and citrus gave the fish a nice flavor and made the house smell AMAZING. How was the experience? Actually, very good! Roasting the fish could not have been easier and the resulting dinner was moist and flavorful. Carving the fish was a little stressful for me, but thankfully Tom fishes frequently and his tips were all I needed to get two large and (mostly) boneless fillets. In the end, a whole fish is also a LOT less expensive than buying fillets–a big plus on our budget! As for the fish head? Well, that is where our cat, Cosmo, comes in. He was in cat heaven. Yes, kinda gross, but at least it didn’t go waste. You can always ask your seafood person to remove the head for you, if it bothers you–you can also use the head and bones to make a fish stock. I give this experiment a thumbs up, and we will definitely try it again with other varieties of fish and other types of seasoning. It’s great to expand your horizons and try something new! Line a rimmed baking sheet with parchment paper or aluminum foil (optional, but it does make cleanup easier). Place the fish on the baking sheet. Salt and pepper the inside of the cavity. Stuff the cavity with onion, lemon and fennel (as much as will fit). Rub the outside of the fish with the olive oil (both sides). Sprinkle with salt and pepper. 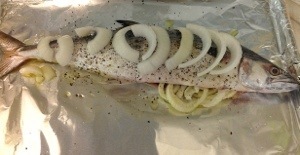 Roast the fish for 30 minutes or until the fish is cooked through and flaky. The timing here will depend on the size of your fish. A larger fish may take up to 45 minutes. 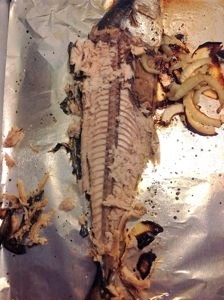 To carve the fish, remove the head and tail and reserve the head for stock (or a lucky kitty). Using a very sharp knife, start at the head end of the fish, insert the knife just above the spine of the fish and run the knife all the way to the tail. Remove the top fillet. You should see the fish skeleton (see photo). You should be able to pick up the backbone at one end of the fish and remove the skeleton in one piece (this will be of endless coolness if you have small children). Trim the remaining bottom fillet and plate.